Like the original Stream Deck, but better. Last year I called Elgato’s Stream Deck “a valuable tool in anyone’s streaming kit.” Long known for affordable capture equipment, Elgato had entered another important hardware niche and created an inexpensive video switcher—one that was only the size of a card deck. With multiple customizable buttons, you could manage all facets of your streaming process without every leaving your primary screen. But maybe even a card deck is too large, and maybe the Stream Deck’s 15 OLED buttons were overkill, because now Elgato’s returned with the Stream Deck Mini—a smaller, scaled-back, and even cheaper version (at $99.95 on Amazon) of the same concept. So which is right for you? Let’s investigate. The original Stream Deck is, as I said, about the size of a card deck—4.5 x 3.5 x 0.8 inches, to be exact. It’s pretty small, and easily tucked away behind a keyboard. And there’s a lot of utility in that compact space, with the aforementioned 15 OLED buttons arranged in a 3x5 grid. These buttons are fully programmable by the end-user, and also include the ability to create folders—expanding 15 buttons out to even more, if you (for instance) want to use Elgato’s software to build a group of Twitter-specific actions, another for OBS, another for Shadowplay, and so on, with perhaps a handful of important actions (“Start Streaming”) saved to the top level. It can be difficult to fill all 15 of the Stream Deck’s buttons though, especially if you’re a hobbyist or if you prefer to take care of certain actions the old-fashioned way. I ended up filling our demo unit with some wholly unnecessary functions, like a few pertaining to Spotify. I didn’t need much beyond “Start/Stop Stream,” “Start/Stop Recording,” and maybe some scene-switching behaviors. The Stream Deck Mini seems tailor-made for people like me. Instead of 15 buttons, it has six, three per row. They’re still OLED buttons, still fully programmable and with the ability to customize the icon on each. In other words, it has the original Stream Deck’s functionality, just...less of it. That’s more than enough for me though. As I said about the original Stream Deck last year, I’ve long envied how easy consoles make the streaming process—basically push a button and go. The PC still isn’t quite so easy, and setting up OBS or Shadowplay efficiently takes some know-how, but we’re getting there. The Stream Deck Mini streamlines the process even more. Once you’ve got it set up, it really is about as easy as push-a-button-and-go. Ah, perfect. My own desktop Brad Chacos companion. That said, setting up the Stream Deck Mini is still a bit arduous. The basics are easy enough: Mapping a command to a button is a drag-and-drop process. Then you edit some basic info, give it a title, maybe change the typeface to Comic Sans—pretty simple. For some reason the icon creation tool is still a web portal though, which feels clumsy and slapdash. Given that icon customization is a huge part of the Stream Deck Mini’s pitch, it’s bizarre the Key Creator (as Elgato calls it) isn’t included in the same software package as the rest. The list of available commands has gotten very long. You’d think streaming would be a fairly set market at this point and yet in the past year Elgato has added entire new categories for Mixer and Streamlabs OBS, plus a soundboard section—to say nothing of new commands added to existing categories like original OBS and Twitch. It can be a bit overwhelming, especially if you’re just getting into streaming. What even is the difference between OBS and Streamlabs OBS? Do you need to care? This isn’t really Elgato’s fault of course, but it speaks to the fragmented nature of the PC streaming universe. There are benefits, in that it evolves quickly and companies push for new and better features constantly. But the learning curve on the user’s part is a bit much, and the Stream Deck doesn’t do much to ease people in. There’s no “Default” or “Recommended” setup for new users to fall back on. It’s knowledge even hobbyist streamers will need to acquire though, because the truth is we’re not at that turnkey stage on PCs. Just getting closer. And more advanced users will love the flexibility of the Stream Deck Mini. 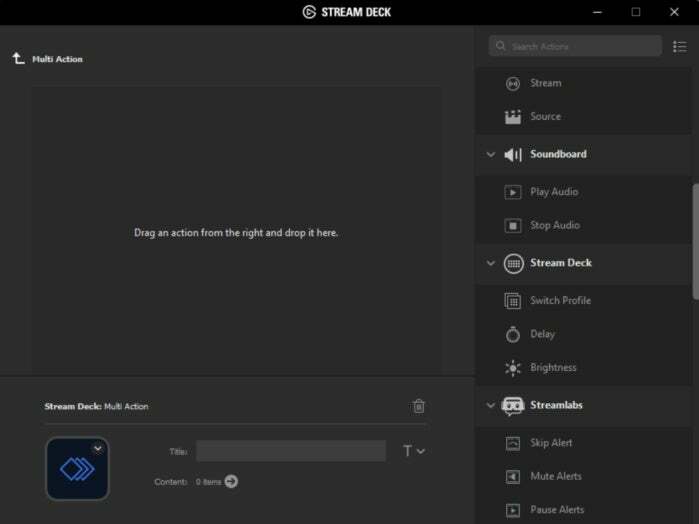 My favorite command at the moment is the Stream Deck’s “Multi-Action,” which, for instance, lets me start streaming in OBS, tweet out the start of my stream, and send messages to Mixer and Twitch, all at once. Or, maybe scroll a graphic across your stream to thank someone for tipping, plus play a corresponding noise and send a message to Twitch chat. It’s worth noting that there are hardware improvements too. One of my big problems with the original Stream Deck was its hybrid flat/angled design. It arrived lying down, but an included stand could angle it towards you. The problem: When you did so, the cord stuck straight out the top. The Stream Deck Mini ditches the hybrid design, and is instead always angled towards you—probably, I assume, the way most people are using the original Stream Deck anyway. The side-benefit is that the cord now sticks out from the bottom like you’d want, and the cable connection is now slightly recessed into the base to protect it from flexing. The actual chassis is plastic, but feels dense and durable, and the whole device doesn’t measure more than 3.3 x 2.4 x 2.3 inches. I’ve been out of town most of the summer, and can thus attest to durability here. I threw the Stream Deck Mini into a backpack on my way out of San Francisco, and despite multiple flights it still looks brand new. And it’s small enough to travel, too. If you’re a streamer-on-the-go, the Stream Deck Mini might not be as important as a good mic or webcam or whatever, but it’s one of the smallest and most versatile video switchers I’ve ever seen, and an excellent piece of kit. No offense to the original Stream Deck, but the Stream Deck Mini is the product most people should get. Sure, the original is still a great piece of hardware, but the Mini improves on it. What’s more, 15 buttons is frankly overkill for most people, hobbyists and professionals alike, especially when you can set up folders (and even subfolders) full of actions. Six buttons is perfect. Keep a few important commands at the top level, throw in a few folders full of rarer ones, and you’ve got a video switcher that would make anyone jealous—and for just $99, which is a steal. It’s hard to see how anyone could compete with the Stream Deck Mini at this point, because as far as I’m concerned Elgato’s perfected it. Elgato's Stream Deck Mini refines the previous video switcher into a smaller and less expensive version, but retains enough flexibility for both hobbyists and professionals alike. Takes a bit of setting up. No default options. You can use Comic Sans on it.